I am too shocked to post anything. This may be the worst catastrophe our country has seen since 911, the crash of "29" and the depression that followed it. Our representatives owe us more than this. Passing the Bill would have been an attempt to help. Good luck Main Street. Did you really think that Wall Street had no connection to Main Street? We'll see what happens, but it doesn't look good. Order now for December gift-giving! This collection of two dozen poems written by Adele Kenny between the ages of four and ten is a delightful look at childhood from the perspective of a child. The poems invite adult readers to remember their own childhoods and are appropriate for even the youngest readers – a perfect Christmas, holiday, or special occasion gift for the child in you, for family members and friends, and for the children in your life. Your pre-publication order will help determine the size of the press run, so thanks in advance for ordering now! The wind was like an old man breathes. It coughed outside the house. That scurried through clouds like a mouse. That the kite was having its turn. But I try not to do those things. And had its own blue wings. To play knights and make it my shield. And there we were in the empty field. Daniel Zimmerman, a native of Buffalo, New York, has taught English at Middlesex County College in Edison, NJ, since 1979. A founder of Niagara-Erie Writers, a consortium of artists and small presses in Buffalo, and former artist-in-residence in that city, he has also worked as a landscaper, reporter, and freelance writer. He served as associate editor of the issue of Anonym that first published Ezra Pound’s last canto, and as editor of the single-issue magazines The Western Gate and Brittannia. The Institute of Further Studies included his fascicle, Perspective, in its series, a curriculum of the soul (Canton, NY: 1974). He collaborated with American/Canadian artist Richard Sturm on a livre deluxe, See All The People (lithographs, serigraphs and embossings: Toronto: Open Studio/Scarborough College, 1976). His dissertation (State University at Buffalo, 1984) explored the poetics of William Blake and John Milton. In 1990, he received a Mellon Fellowship to study visionary poetry at the Graduate School, City University of New York. In 1997, he invented a new, anagrammatical poetic form, Isotopes. From 1996 to 2001, he edited College English Notes for the New Jersey College English Association. 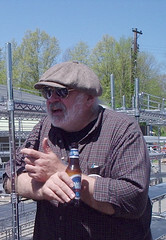 He has published several collections of poetry, including the trans-temporal collaboration blue horitals (with John Clarke: Amman, Jordan: Oasii, 1997), ISOTOPES (London: Frame Publications, 2001), and Post-Avant (Columbus, OH: Pavement Saw Press, 2001; introductory note by Robert Creeley). His work has recently appeared in Chain, Tinfish, Deluxe Rubber Chicken, House Organ, Snakeskin, An Exaltation of Forms, and ETC: A Review of General Semantics. I was in the back yard this morning playing my Irish tin whistle, and minding my own business when two sparrows landed on the glass top table and looked up at me before flying off again. I felt like friggin Orpheus! The sun rose over the flood wall. A crow cawed in the field which I discovered is filled with wild basil, thyme, and oregano. Any time I want, I can pull up a bunch, and breathe the smells in. If Mary Oliver had shown up and written a poem about it, I would not have been at all surprised. Why don’t I write a poem about it? Pastoral poems take us back to the obvious. We become awed by the sheer fact of natural matters. Look: Grass! Tree! Junco! Sparrow! Jay! Look: deer nuzzling the fallen crab apples, their coats honeyed as the soft morning light. There is always a chance people, mean, heartless, normal folks, will say: “so what? Big deal! I see crows every day.” But do you? Are you sure? A pastoral poem always risks being absurd because the poet is awed by the obvious. It’s as if you had lived with a woman for thirty years and then noticed, all of a sudden, that she lives with you, that her existence matters greatly. To be surprised by the obvious is one of my favorite experiences: It’s six am. There’s a coffee sitting beside my book of John Clare poems. The sun helps the white pine cast its most flattering shadows. The ground hogs are not so ubiquitous, and the chill in the air means fall is pulling in and due to arrive momentarily. I need to wear a sweater now when I sit at my table. The other morning my breath turned to smoke as I played, and I was elated. My friend Joe Salerno once complained to me that poets write too often of human relations. Even when they write about nature, they do so in a way that stains it with the human. It always pissed me off when Mary Oliver wrote about grass hoppers eating sugar from her hand--as if she was the earth mother. I don’t believe her. I’ve seen Mary Oliver. I’m not a grass hopper, but no way, I’m taking sugar from that woman. BILL ZAVATSKY and many others. Doors are open both days from 9:00 am until 10 pm. toward my beaten body where I no longer live. I sail. I swoop now. I fly in rings and ribbons. I curl and dash with tails of personal history. I circulate the room as air itself. Squeezing past the tears of mothers, burning moist. My spirit has left my body. Good riddance. though I am helpless to my corpse? that everything we did was wrong. Everything we did was wrong. We tattoo’d trouble on our arms. because everything we did was wrong. Every last little thing we did was wrong.